MetaCRAM is a pipeline for taxonomy identification and lossless compression of FASTA-format metagenomic reads. It integrates algorithms for taxonomy identification, read alignment, assembly, and finally, a reference-based compression method in a parallel manner. We live in a “Big Data era” in which the amount of information is overwhelming for current storage and processing capacity. Metagenomic data is no exception: the volume of sequencing data is increasing rapidly, requiring a compression tool for long-term archival storage. MetaCRAM precisely addresses this problem and its performance was evaluated on various metagenomic samples from the NCBI Sequence Read Archive, suggesting 2- to 4-fold compression ratio improvements compared to gzip. On average, the compressed file sizes were 2-13 percent of the original raw metagenomic file sizes. Compression ratios of this order will provide for tremendous storage savings. Figure. Block diagram of MetaCRAM. How do I download MetaCRAM? You may access MetaCRAM’s source code, installation guideline and README in the Github repository. We tested MetaCRAM on a linux machine with Intel Core i5-3470 CPU at 3.2 GHz, with a 16 GB RAM. After following the installation guideline from our Github repository, use the following commands to run MetaCRAM. 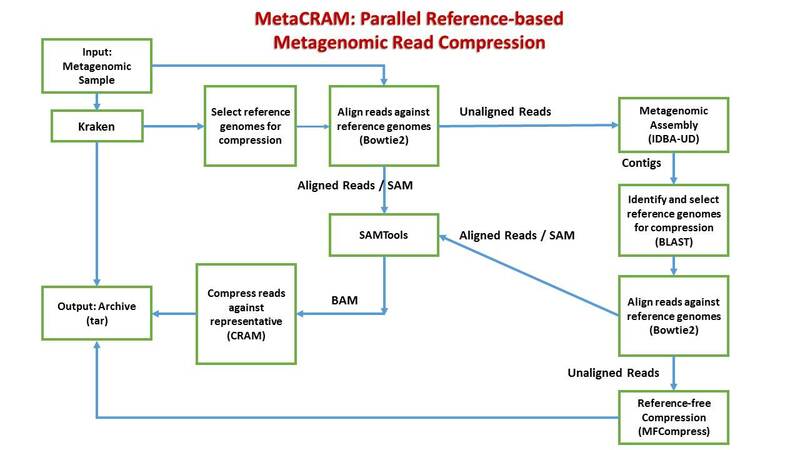 “MetaCRAM: An Integrated Pipeline for Metagenomic Data Processing and Compression”. M. Kim, X. Zhang, J.G. Ligo, F. Farnoud, V.V. Veeravalli, O. Milenkovic.